Since our last newsletter our volunteers have been very busy. As well as the regular work party last month, we have recently run a work party for a group of young people on a Prince's Trust training scheme and last weekend - for the second time - we hosted a Waterway Recovery Group Family Camp at Crumpwood. This activity aims to involve children in a range of outdoor activities which they will find interesting and enjoyable, whilst delivering practical works to assist our project, and of course with a view to them becoming more involved in volunteering on the waterways as they get older. It is also an opportunity for any adults who would like to help out with some slightly larger tasks. Our volunteers helped with trimming vegetation, pulling Himalayan Balsam and put up a number of bird boxes. In addition, some of the group planted posts beside the roadway at Carrington's Lock to make it more obvious to drivers, cyclists etc. that they should stay on the road in that area. The Family Camp was once more supported by Tesco Bags of Help scheme. We are very grateful to them and of course to everyone who visited a store in Uttoxeter and voted for us earlier this year. 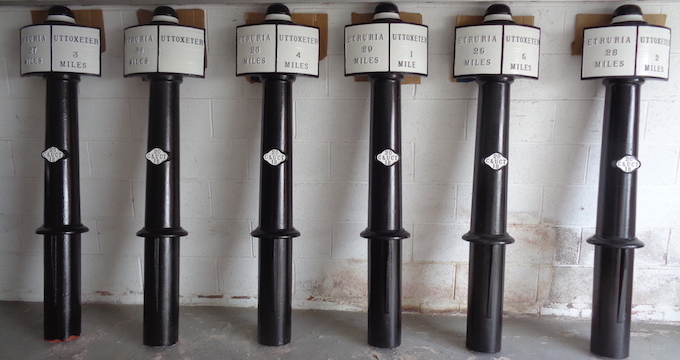 The painting of mileposts has now been completed and the first two (on the JCB estate) will be installed shortly. Thanks to everyone who has helped out with this project so far. We have made good progress in finalising the positions of the remaining four posts and are presently working with partners in the local area to ensure that the line of the Uttoxeter Canal becomes part of a heritage trail from the town into the Churnet Valley. The next work party is later this week, Thursday 14th June. As last month we will be meeting at Alton, meeting on Farley Lane near to Alton station from 9:45am. For those using satnav, put in ST10 4BY. The work site is a short walk from this spot. There is parking off-road down a slope parallel to the former railway line, opposite the station. The task will be a continuation of last month's very successful event, clearing the towpath of low-lying vegetation in the Crumpwood direction. All tools and equipment will be provided. Volunteers are advised to wear old clothes, stout shoes and to bring waterproofs in case of rain and a packed lunch if staying all day. The July work party will move back to Crumpwood where we will be pulling Himalayan Balsam as well as cutting back vegetation regrowth at Bridge 70, Carrington's Lock and Crumpwood Weir. It would be great to have a really good turnout for this event, so please share the word to anyone you think might be interested. This newsletter is the first to be sent to the new mailing list. Thanks to everyone who has signed up. Please do tell others about it as we would like to spread the word and involve more people in this exciting project. Sadly we lost a few people in the move to the new mailing list so I'm keen to get the numbers up again. You can share this newsletter with you friends by linking to it on the CUCT website by email or on social media. There is a link to sign up on that page.